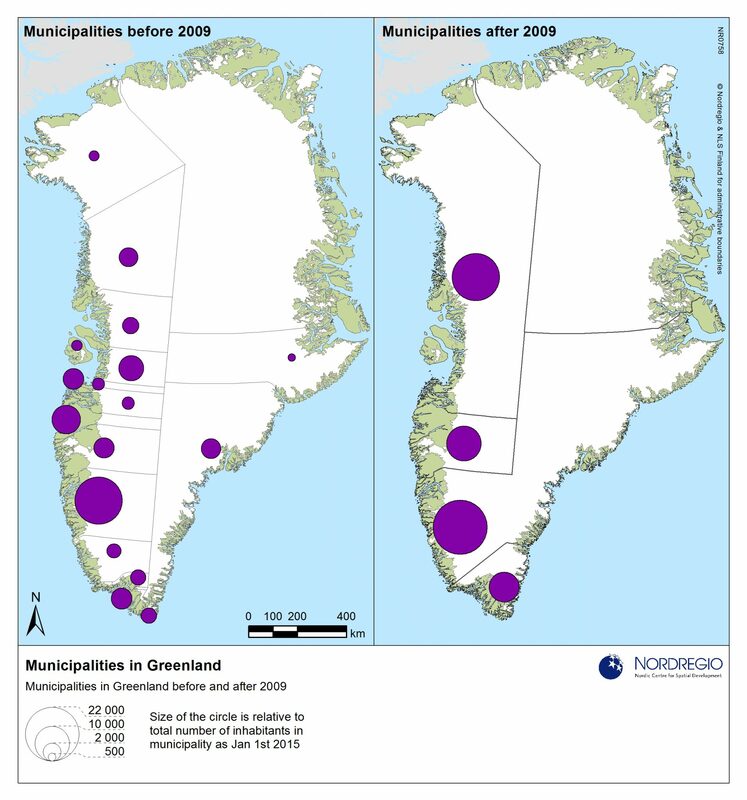 On the first day of 2009, Greenland switched from 18 municipalities to just four. The transition had been prepared over several years, and most of the political parties supported the change. The idea behind the transformation was to delegate political decision-making power and economic resources from the central administration to municipal administrations. In reality, one of the very few administration areas that have now been transferred to the municipalities is the administration of land use and spatial planning. The municipality that covers the west coast of Greenland from Disco Bay to the Qaanaaq area, Qaasuitsup Kommunia, is the largest in the world in terms of square kilometres. Kommuneqarfik Sermersooq, which includes the capital Nuuk (on the west coast) and the east coast of Greenland is the second largest. However, in terms of inhabitants, all the municipalities are very small. Qaasuitsup Kommunia comprises eight of the former municipalities. Not long after the new municipality came into being, the citizens of several settlements began complaining about the new administrative structure. A typical complaint was that the new structure had centralized many administrative decisions. These kinds of complaints indicate that in the opinion of the citizens, politicians and even researchers, there has been a decline in the degree of democracy. This widespread dissatisfaction with the new municipal structure resulted in a consultative referendum in Qaasuitsup Kommunia in April 2014; 12,644 citizens were entitled to vote but only 6,603 did so, which is a 52.2% turnout. The question for the consultative referendum was whether the municipality should be divided into three new (and smaller) municipalities; 79% voted yes, and 21% voted no. The possibility of splitting up not only Qaasuitsup Kommunia, but also Kommuneqarfik Sermersooq is on the national political agenda of the parliament, the Inatsisartut, this autumn. The economic and potential administrative consequences of a division of one or two of the municipalities have been the subject of reports. At present (September 2015), it is not clear in which direction a national political decision on dividing one or both of these municipalities would go. As mentioned above, one of the main arguments for splitting up the large municipalities has been the re-establishment of local and more democratic administrations. At least, that is how it has been interpreted by many stakeholders in the public debate. I do not find this interpretation adequate. It is a fact that many administrative processes have been professionalized, and have become more democratic in a more accurate sense. By that I mean that the new structure of four large municipalities has ensured more uniform and “by the book” administrative decision-making processes. The dissatisfaction of many citizens with the new system can also be interpreted as dissatisfaction that administrative decisions can no longer be negotiated and tailored to “particular circumstances”. If this is the case, then the real reason for the dissatisfaction among the citizens is actually rooted in a desire to return to a less democratic administrative practice where “particular circumstances” and the personal relationships between clients and administrators again can play a certain role in municipal administration. Reforms sweeping over the Nordic countries?